Body percussion is an incredibly useful and powerful tool for music teachers. Music lessons should start with a practical element, and body percussion is ideal for this as it requires no equipment or set up – budget friendly, and perfect for those days when you have a classroom change! But body percussion has so much more to offer than a quick starter activity. It can be used to develop the whole musician and teach rhythm, composition, listening, ensemble and performance skills. The possibilities and benefits are endless. Here are just a few of the ways you can use body percussion both in and outside the classroom in your school. Practiced regularly, body percussion will help pupils to internalise their ability to feel the music and stay in time. Body percussion is also great for learning complex rhythms, for example, syncopation makes a clave rhythm challenging, but breaking it down using stamps and claps helps to bring the pattern to life. To really explore the power of body percussion in the classroom, look no further than the BBC ‘Ten Pieces project’. They selected a piece by Anna Meredith – one of the UKs most exciting young composers. Click here for lesson plans, video tutorials and more. As well as performing, body percussion can be a great way of scaffolding basic composition skills. Get your students composing their own pieces using rhythm grids like the one below. Rhythm grids can be a good starting point for introducing different styles of music, for example Reggae with it’s off beat rhythm pattern, or use them to show how syncopated rhythms don’t always fit neatly in the boxes. At GCSE and A-level take a look at Steve Reich’s Clapping Music, get your students to learn and perform the piece then get them to compose their own minimalist body percussion piece. The benefits don’t end in the music classroom! Body percussion could also be used as part of a dance project, or in drama and english to create performance poetry. Or how about incorporating body percussion into the new computer science curriculum? Teaching some of the concepts of computational thinking such as patterns, loops and algorithms can be easy and fun with body percussion. Take the action symbols from the rhythm grid above, then introduce the loop symbols below, show how you would add the loop symbol in front of the actions that you want to repeat. Then take the traffic lights “IF” symbol to introduce Conditional statements, for example IF I clap twice, you click, stamp, stamp (just like call and response). 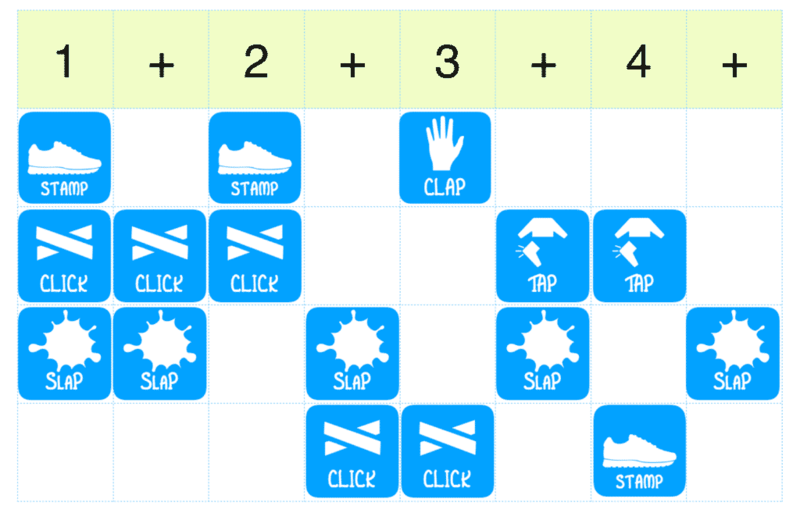 Get your students to compose their own body percussion piece using the loop and IF symbols. If you want to start your next open evening or sports day with a bang, how about getting your choir or orchestra to perform a body percussion piece at the start? Feeling sceptical? Take a look at the National Youth Orchestra’s performance at the Proms in 2012. What an exciting way to revitalise a school event! To create a real buzz around your school, why not think big and run a whole school competition? Give it a catchy title, like “Extreme Body Percussion”, and hold a special launch assembly. To help give pupils an idea of what’s involved, show a video of a performance from a group like Molodi and offer some workshops led by older students. Make it an inter-form competition, where each tutor group competes in their year assembly. The panel of teacher judges then selects one form from each year group to compete in the live finals to take place in a whole school assembly. Fantastic resource opening so many possibilities for exploring rhythm and music.Thank you. Thanks Veronica, glad you find it useful!